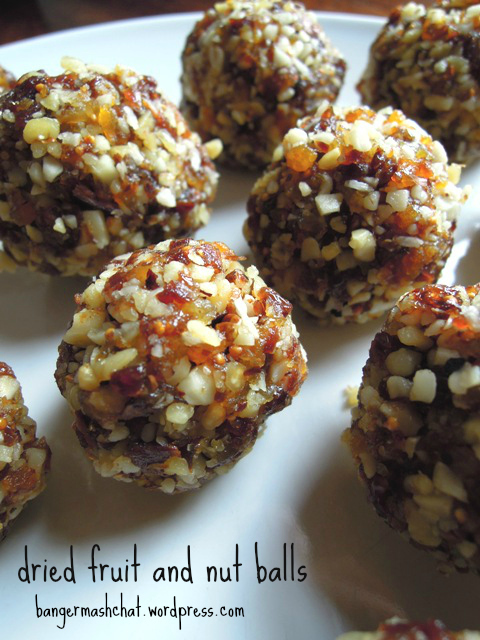 Admittedly, these might look like something you’d hang out for the birds in winter but trust me, these dried fruit and nut balls are delicious. Ask my children – they love them in their packed lunches or after school as a quick and healthy snack. They’re very easy to make and the recipe is extremely versatile – play around with the recipe and add your own favourite nuts and dried fruits. I’ve used dried apple in this version as I’d dried some of our own apples as one way of storing them. 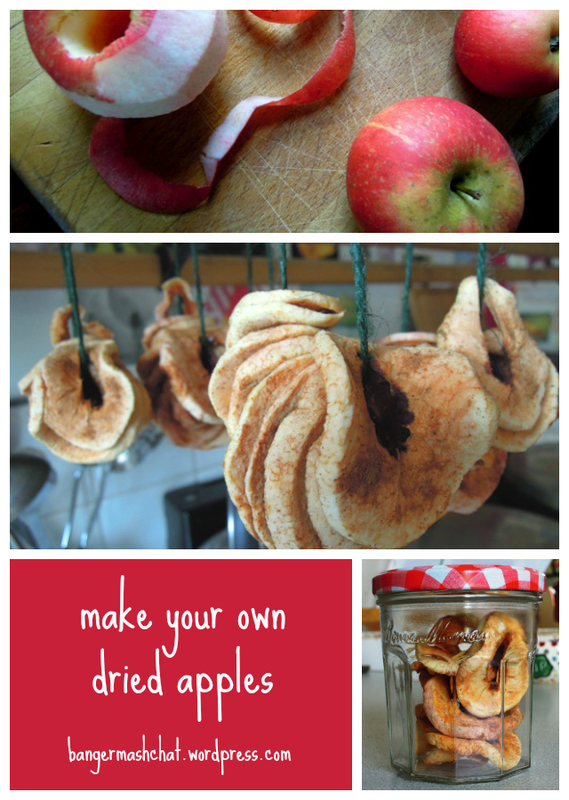 If you’ve never tried drying your own apples, you really should. The apples develop such a gorgeously intense flavour and they have a wonderfully satisfying texture, rather like chewing on a soft toffee but with none of the sugar-guilt. My girls can’t get enough of them. If you fancy having a go, here’s what you do. Peel and core your apples and cut into rings. Sprinkle with cinnamon or leave plain if you prefer. Spread out on a baking tray and put in a very, very low oven for a few hours. If you have an Aga you could put them in the bottom oven or do what we did and tie with string and hang in bundles over the top. They’re ready when they’ve gone all wrinkly and have gained that lovely chewy consistency. We eat them as they are, chop them up and mix into plain yoghurt, or add them to homemade granola. But back to those dried fruit and nut balls. It’s simply a case of whizzing up all the ingredient in a food processor and then using your hands to shape the resulting mixture into balls or, if you prefer, bars. It’s a fairly messy business, which is probably why children quite like getting involved. 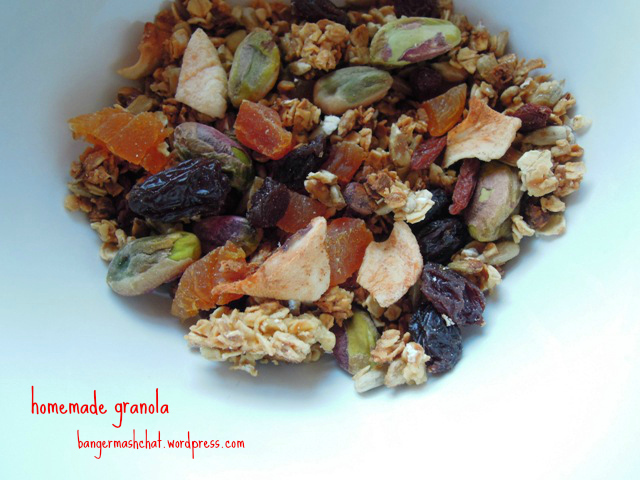 Put the nuts and dried fruit into a food processor and process until it you end up with a mushy, sticky mixture. Add the oil and apple juice and whiz again briefly to combine. Mould the mixture in your hands into small balls and store in an airtight container in the fridge (for a couple of weeks) or the freezer (for a couple of months). I wrap individual balls in foil, like sweetie wrappers, when I put them in the girls’ lunchboxes. 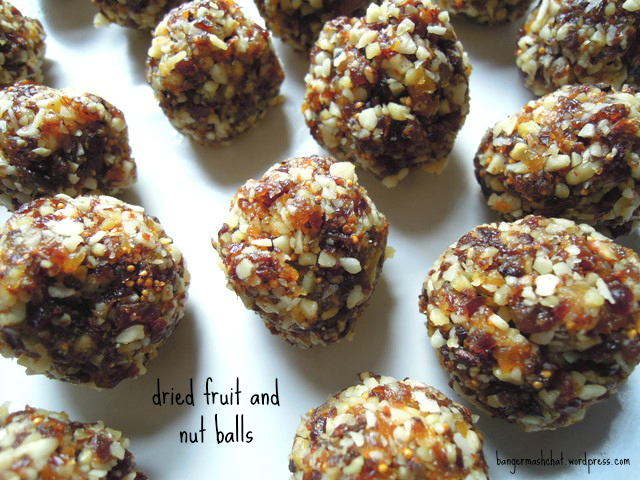 Since my children enjoy them in their lunchboxes, I’m including both these fruit and nut balls and the dried apple in November’s Family Foodies challenge, which as you probably know has lunchbox ideas as its theme. Lovely idea. I need to make myself some so I don’t keep reaching for the biscuits.